I don't know what I was thinking. The words "dance" and "party" are right in the title, two words that strike instant fear into my heart! But I love Mixed Blood Theatre, so I took a chance on their new creation DJ Latinidad's Latino Dance Party, knowing it was probably not my thing. I was not wrong. Standing in a corner of Mixed Blood's open space where the theater usually is brought back that very specific terror of a junior high dance, which is when I stopped going to dances. But obviously this theater nerd/blogger/introvert is not the target audience for this piece. If you're someone who likes dancing, parties, and loud music, you'll probably have a great time, as most of the crowd seemed to. Me, I'll stick to sitting in the seat of a dark theater watching a story play out in front of me at a safe distance. The versatility of Mixed Blood Theatre's black box space is truly on display here. No signs of seats or a stage, just an elevated DJ stand on one side and a few benches along the walls, leaving plenty of room for the dancing. Real life DJ BreakBeat Lou plays the role of DJ Latinidad, as an ensemble of seven actor/singer/dancers (Brian Bose, Christopher Rivas, Mildrid Ruiz-Sapp, Natalie Camunas, Raul Ramos, Ricardo Vazquez, and Thallis Santesteban) dance, sing, engage the crowd, and perform commissioned short plays about the Latino experience. Over the course of 90 minutes, about a dozen vignettes that range from poignant (a young man who lost his mother and brother to cancer) to silly (the owner of a lemon store) play out in various places on the dance floor (which makes sightlines challenging). Each night features a special guest or two. We were treated to a Michael Jackson impersonator (although what Michael Jackson has to do with the Latino experience is unclear to me) and a fantastic salsa-ing couple from Costa Rica Ballroom. In between the short plays the DJ plays music and the ensemble encourages the crowd to join in on the dance party. Even though I did not partake, it is fun to watch people dance who really know how to dance (and sometimes those who don't). Conceived and directed by Mark Valdez, DJ Latinidad is a creative and inventive way to explore Latino culture through total immersion. Unfortunately, my people are German, a culture not particularly known for its rhythm or ability to cut loose, so the effort was mostly lost on me. But if this is the sort of thing you like, you might find that you like this sort of thing. "This sort of thing" meaning great music and dancing, with a bit of theater thrown in. 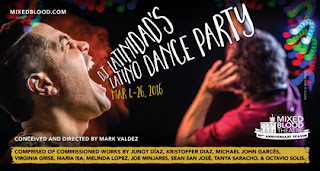 DJ Latinidad continues through March 26, with late shows on weekends.